IT organizations have hit a breaking point in siloed management tools to address one of the most critical issues today - cybersecurity hygiene. In particular, numerous point solutions targeting the endpoints drive cost, complexity, and other challenges. New investments in cloud, distributed workforces and increasing numbers of connected devices only exasperate this problem. Addressing cybersecurity hygiene means that critical actions must be made on demand versus scheduled. Teams must also have confidence that assessment results and remediation actions are complete. 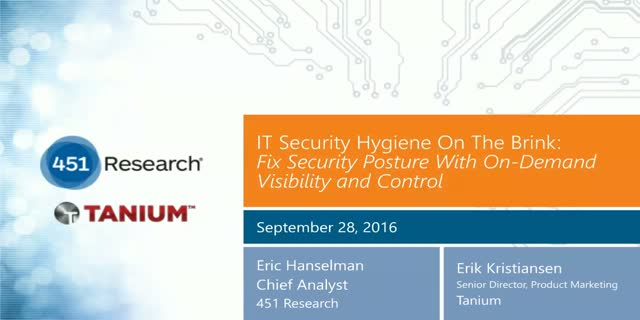 Come learn about the key issues why cybersecurity hygiene fails in most organization. We’ll discuss in depth how the platform approach and speed of Tanium are poised to fix this critical problem. Eric Hanselman, 451 Chief Analyst, and Erik Kristiansen, Senior Director of Product Marketing at Tanium will discuss.